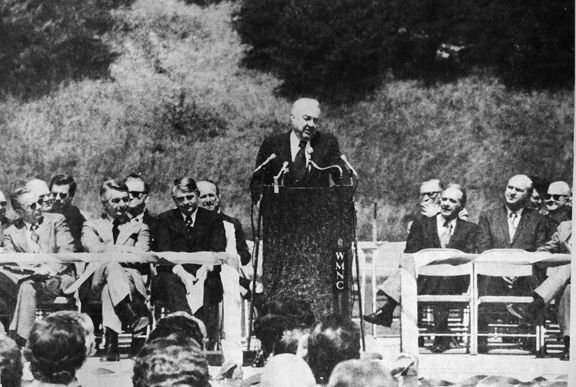 Forty-six years ago this week, U.S. Sen. Sam J. Ervin Jr. was the featured speaker at the formal dedication of the new Marimont Furniture Co plant in Marion. Ervin, a native of Morganton, was in the national news at time because he was the chairman of the Senate’s Watergate committee. He and other senators were investigating the Watergate scandal, which later resulted in the resignation of President Nixon. At the Marimont dedication, Ervin spoke about the free enterprise system but did not mention the Watergate incident, The McDowell News reported. 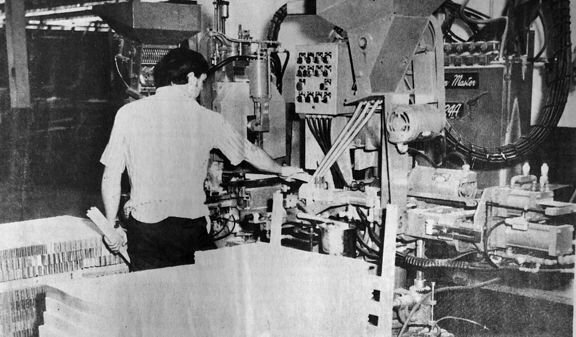 During the week of April 7, 1973, Bill Miter is shown operating one of the machines at the new Marimont Furniture Co. plant. This particular machine was used to bore holes and insert dowels for chair frame railing. The entire McDowell County community was invited by Marimont and Henredon Furniture industries to tour the new plant during its dedication day. Forty-six years ago this week, this was the scene on an early Wednesday morning as some 178 students and their chaperones prepared to board a Trailways bus in Marion for a trip to the N.C. Museum of Art in Raleigh. The trip was sponsored by the McDowell Arts and Crafts Association (MACA). The students and the chaperones were scheduled to arrive in Raleigh shortly before noon and after some four hours of tours through the museum were scheduled to board the buses for the return trip. They were set to arrive by 10:30 p.m. that Wednesday night. Forty-six years ago this week, McDowell County observed National Action for Foster Children Week. The McDowell News reported that for Mrs. David Russell and her husband every week was Action for Foster Children Week. The Russells were one of 17 couples in McDowell who were involved in the county Department of Social Services’ Foster Home program. Each day, the four pre-school children in the Russell home had a reading session. During the week of April 7, 1973, students at West McDowell Junior High displayed some of their handicrafts which they made during National Heritage Week. The displays inside the school auditorium featured replicas of famous battles, log cabins, weapons, war medals and numerous other items. Some of the students showing their handicrafts were (from left) Susan Parks, Neil Rabon, Steve McMahan and Doug McCraw. During the week of April 7, 1973, principals and student bus drivers with the McDowell County School System were the dinner guests of the Marion Jaycees at their regular meeting at the Community Building. Gilbert Byrd, assistant principal at McDowell High and coordinator of the system’s transportation department, presented each driver with a certificate of appreciation and School Superintendent James E. Johnson gave a little presentation giving details of the transportation system. The purpose of the dinner was to honor drivers for their outstanding safety records. At the meeting were (from left) Superintendent James E. Johnson, school bus drivers Shelia Byrd and Eric Upton and Jaycees President Art Bolick. During the week of April 7, 1973, young and old alike were happy to see a sure sign of spring in Marion: the return of Lee Rides to the vacant lot on State Street. The carnival, which was sponsored every year by the Marion Fire Department, featured such fun rides as the Ferris Wheel, the Scrambler, the Octopus and the Merry-Go-Round along with usual concessions of burgers, hot dogs, popcorn, cotton candy and Cokes. Forty-six years ago this week, Foothills Community Theatre was preparing to present the play “The Devil and Daniel Webster” later that month in the auditorium of West Marion School. The play was considered to be one of the best ever written and cast members had been working nightly during the rehearsals for the production. Members of the cast were (front row, from left) Deana Setzer, Glenda Baird, Libby Lytle and Kent Lytle and (back row, from left) Ann McClellan, Mary Lee Lytle, Sid Carrigan, Alice Ostrom, Roger Long, Gene Fowler, John Fall, Kristi Neal, John Crawford, Bonnie Setzer, Bill Key, Roberta Whitaker and James F. “Speedy” McClellan. During the week of April 7, 1973, these were the members of the West Marion basketball team, who won the championship game over North Cove in the Adult Basketball League. The members of the team were Troy Williams, Billy Pearson, Willie Fields, Carl Jackson, Gus Smith, Phillip Swepson, Marvin Carson, Delbert Rutherford, Keith Barry and were coached by Ken Jackson and John Kincaid. Editor’s note: This feature mines our archives for what was going on this week in local history.